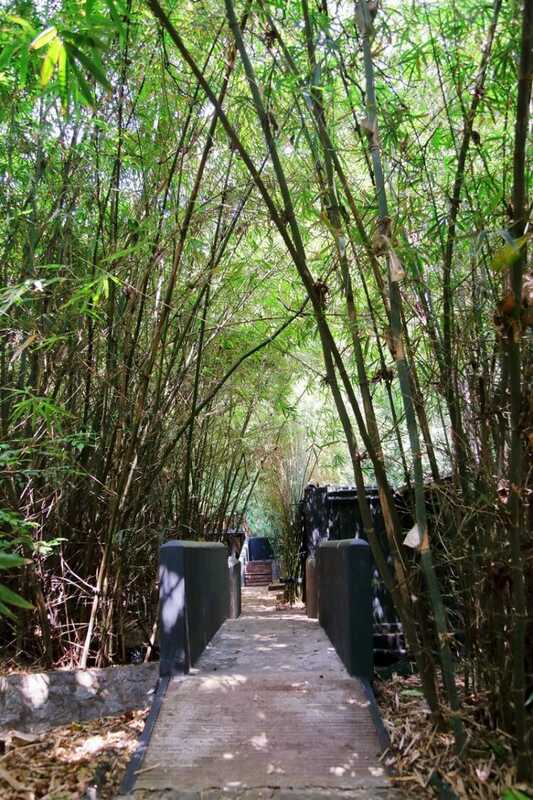 Diyabubula is a secret jungle hideaway designed by a renowned Sri Lankan artist. Read on for my Diyabubula hotel review! Every so often a property comes around that shows you how a hotel can break through conventional categories and stereotypes of what a hotel should look like. 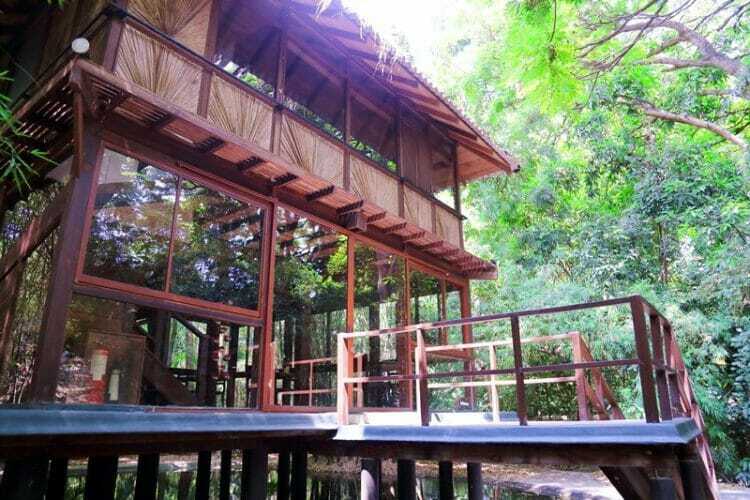 Diyabubula near Sigiriya is one such place where you can sense the love, energy and thought that went into the design and construction of the hotel. 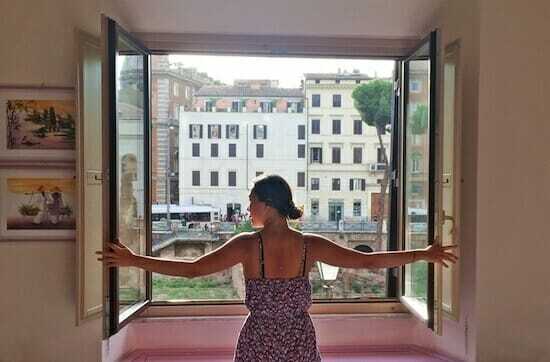 If you’re a Yoga, Wine & Travel reader then you’ll know that I’m constantly on the lookout for places with soul and personality – not just your average copy-and-paste hotel where you get four walls and a bed. 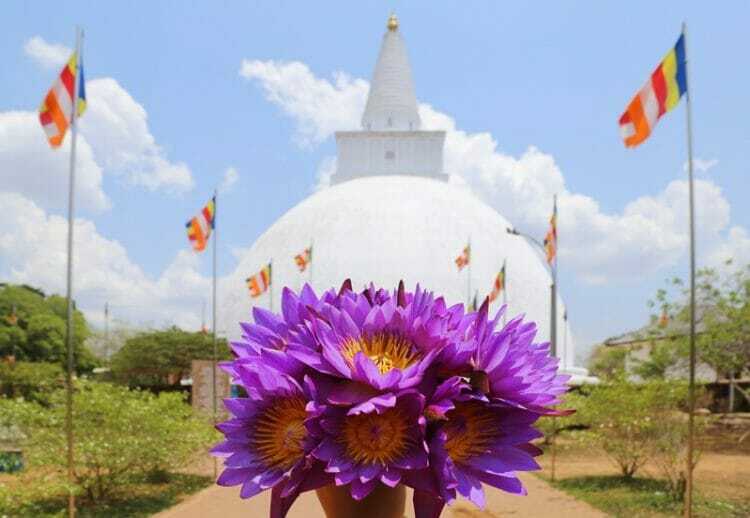 Diyabubula has carved out its own little haven in the heart of Sri Lanka’s Cultural Triangle, where you can be immersed in nature and venture out for cultural day trips to Anuradhapura, Sigiriya, Polonnaruwa or Dambulla or spot wildlife in Minneriya and Kaudulla National Parks. Read on for everything you need to know about Diyabubula in Sri Lanka! Headed to Sri Lanka? Click here for everything you might need to plan your perfect trip to Ceylon! 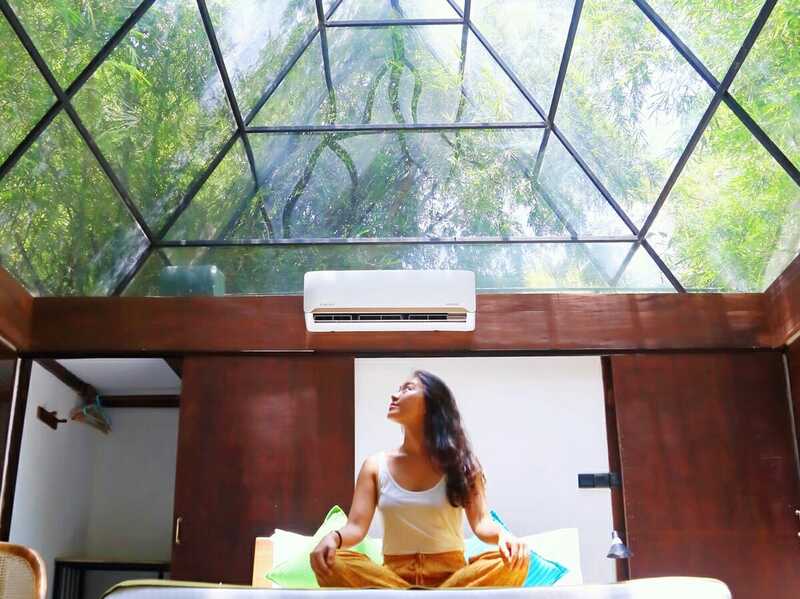 Diyabubula officially opened its doors in 2016, and while it may be lesser-known to the average traveler (for now), it is hailed as an outstanding example of sustainable design by the architecture and landscape design community. Laki Senanayake, the Sri Lankan artist who designed Diyabubula, worked with Geoffrey Bawa and chose 100-year-old railway sleepers and other locally-sourced recycled timber as basic building materials for the hotel. Diyabubula means “bubbling fountain” in Sinhalese as it is built on top of a natural spring. The land the hotel sits on used to be “slash-and-burn” farmland, until Laki replanted the jungle 40 years ago. 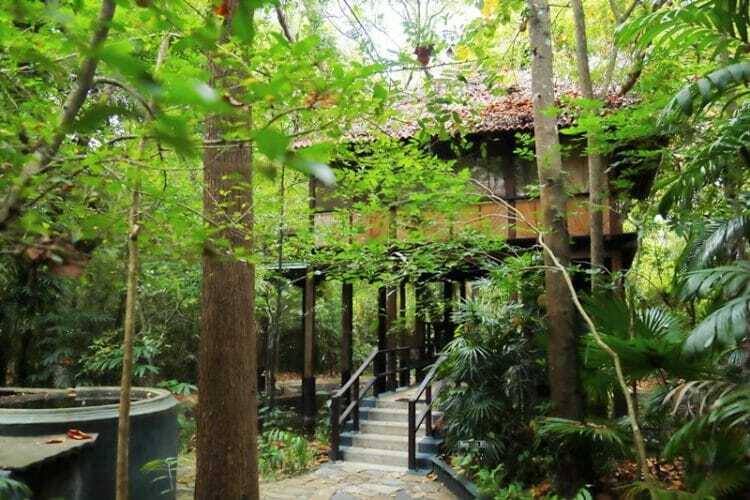 Today, Diyabubula is the perfect retreat if you want to be immersed in nature; the paths and rooms are shaded by dense canopy, and the property is filled with the sounds of birds chirping, butterflies fluttering and monkeys jumping from tree to tree. 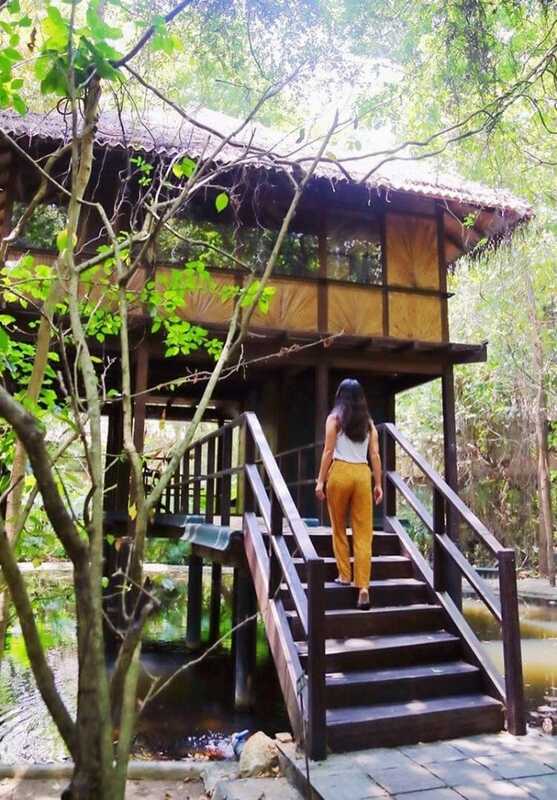 Diyabubula has just 5 rooms, all designed with sustainability in mind: 3 overwater villas, 1 bamboo grove villa with a transparent roof, and 1 tree house. The light-flooded overwater villas sit 4-5 meters above a pond with a small seating area below, king-sized bed, en-suite toilet with a rain shower and private balcony. Though there is no air-conditioning unit, there are 2 fans to keep the room cool. Each room features original digitally-printed creations by Laki. 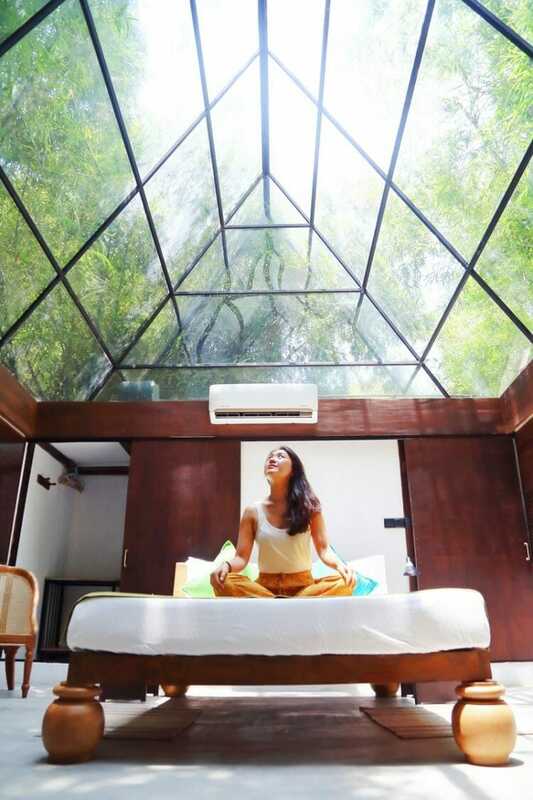 The unique bamboo grove villa features a transparent roof so that you are shaded by the dense bamboo stalk and leaves during the day, and surrounded by the night sky and stars at night. The room does offer an air-conditioning unit as it can get steamy during the day, and also offers an en-suite bathroom. Staying in the tree house at Diyabubula is a one-of-a-kind experience. Though it may be lacking in space and is not suitable for extremely tall guests, the rafters of the tree house are actually living Arcunut trees that have been trained to grow at an angle. The ground floor has a bedroom with a double bed, and the upper level features a single bed and bathroom. Wi-fi is available throughout Diyabubula though the connection can be spotty at times, and it is not uncommon for there to be short power outages – this happens throughout Sri Lanka, especially during the dry and hot months. Ready to book your stay at Diyabubula in Sri Lanka? The boutique hotel only has 5 rooms so book early – click here to check current rates and availability or head on over here for more hotel options near Sigiriya and Dambulla. Diyabubula offers an on-site restaurant serving up delicious, fresh pescatarian and vegetarian-friendly food. The menu changes on a daily basis and you can select from Sri Lankan or Western dishes. 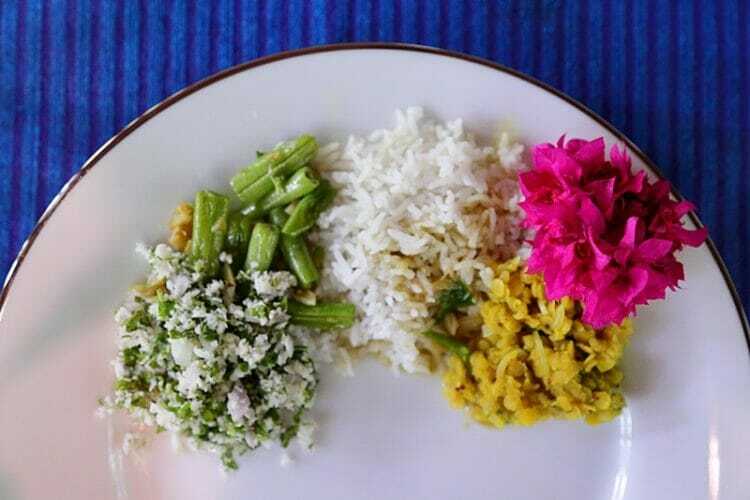 Feast on tropical fruit, oatmeal and an omelette with Sri Lankan spices for breakfast, eat a light lunch of vegetable curry and string hoppers, then finish the day off with grilled fish and asparagus soup. You’re spoilt for choice when it comes to food at Diyabubula. At this time Diyabubula does not have any pool or Yoga facilities, but it is the perfect nature getaway that is enchanting on many levels. Diyabubula is a fantastic base if you’re visiting Sri Lanka’s Cultural Triangle and want some peace and quiet away from the tourist crowds. 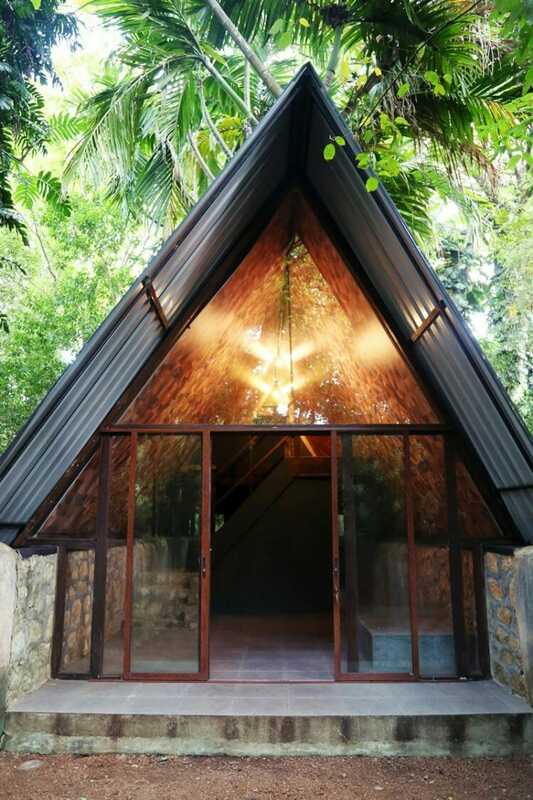 If you are interested in learning more about Sri Lanka, art or nature, you can pop over to Laki’s workshop and home – the 80-year-old still lives and works right next to Diyabubula and is happy to meet with guests in the morning or late afternoon. It’s not often that you get to meet the architect, and believe me when I say that he is as sharp as a tack! We had an hour-long chat on Laki’s lakefront deck about life, death, education, birds (Laki can recognize the bird by their call), nature and sustainability, art and much much more. The human element is very much alive at Diyabubula, and the staff are more than happy to help with any requests or organize day trips and transportation. 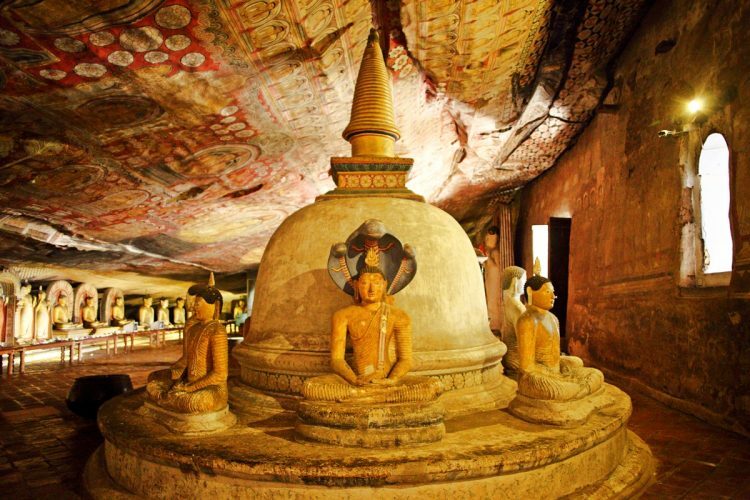 Diyabubula is in a perfect location for visitors who want to check out the Dambulla Cave Temple (30 minutes away), Sigiriya Rock Fortress or Pidurangala Rock (1 hour away), Minneriya and Kaudulla National Parks (1.5 hours away), or the ancient cities of Polonnaruwa and Anuradhapura (2 hours away). Read more about these various Sri Lankan landmarks and national parks by heading over here. I recommend staying no less than 2 to 3 nights at Diyabubula. Click here for the perfect 2 week itinerary for Sri Lanka if it’s your first time to the country! The easiest and fastest way to get to Diyabubula is by private car – the hotel can organize your transportation from the airport and for you to get to your next destination. The drive from the international airport in Sri Lanka near Colombo will take approximately 3 hours. If you’re traveling from Kandy, the drive will take 3-5 hours depending on traffic, and the drive from Sri Lanka’s south coast will take 5-7 hours depending on which town you are staying at along the southern coastline. Diyabubula is a truly one-of-a-kind, off-the-beaten-track hotel with a story to tell. 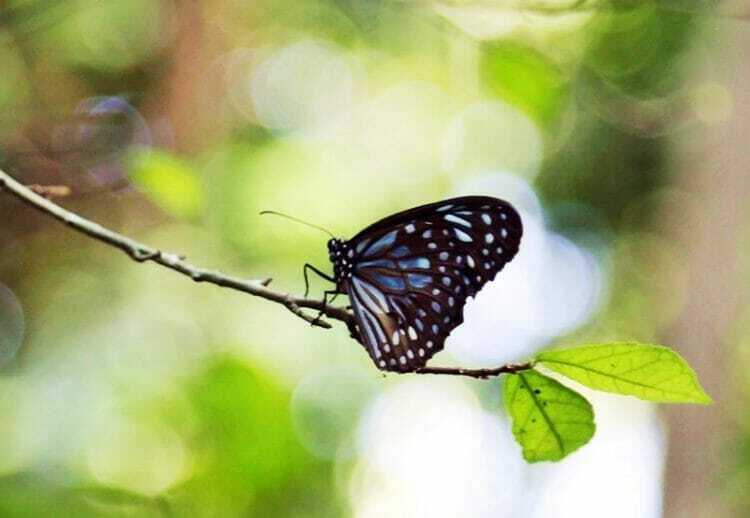 The jungle hideaway is perfectly in harmony in nature with cheeky monkeys and butterflies fluttering about during the day, and fireflies and cicadas making an appearance at night. 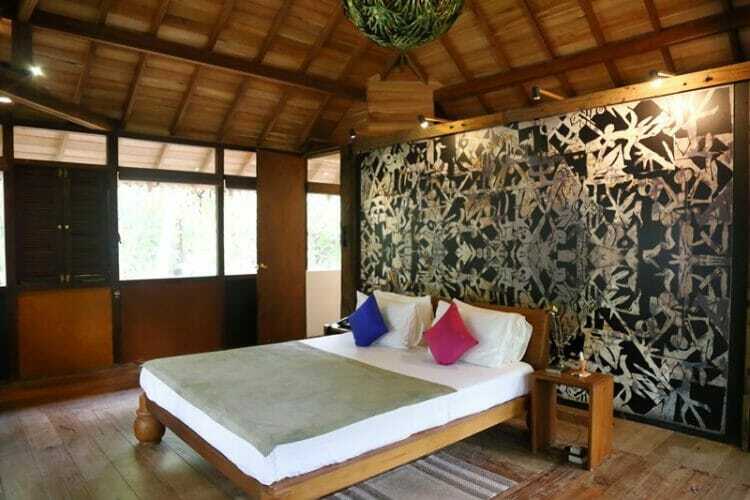 However, if you are squeamish about insects and can’t stand being exposed to the elements, then perhaps this is not the best option for you, in which case you might want to check out my other hotel recommendation near Sigiriya here. The property is also not particularly child or accessibility friendly, with lots of rock paths and stairs. 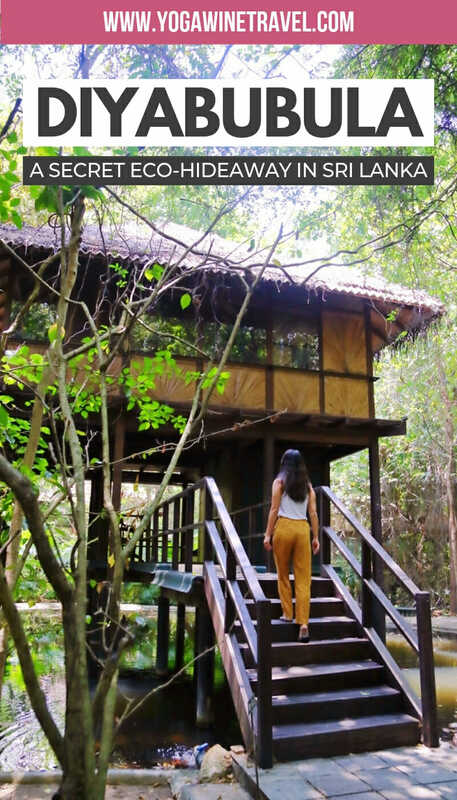 That being said, if you are traveling as a couple, with friends, or a solo traveler looking for a unique eco-friendly accommodation in Sri Lanka where you can unwind, relax and go sightseeing then Diyabubula is perfect for you. Click here to check availability at Diyabubula in central Sri Lanka or e-mail [email protected]. Looking for even more Sri Lanka travel guides and tips? Click here! My stay at Diyabubula was sponsored; however, no compensation was received for this review, and as always, the opinions on Yogawinetravel.com are (and always will be) my own! I only recommend products, services and hotels that I have had positive personal experiences with.